This year is the 200th year anniversary of the American Journal of Science, founded by Yale scientist Benjamin Silliman in 1818. Covering a wide range of topics but with special emphasis on geology, AJS was the premier scientific publication in the United States for decades. It remained at Yale, and the editorship stayed within the Silliman family line, until 1926. It is still in publication, but the editorship has moved over the last 90+ years. Edward Hitchcock, the geologist of Amherst College, in Massachusetts, is known today mostly for his work on “fossil bird tracks” (dinosaur footprints). 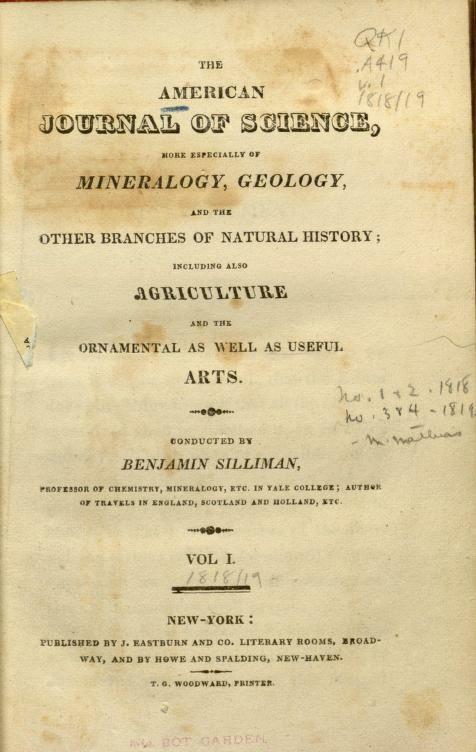 He was a protege of Silliman, making a great first impression with a collection of minerals that arrived at Yale out of the blue, followed by a home-made geological map of the Connecticut River valley. It was the auspicious beginning of a lifelong relationship. Only 25 in 1818 and mostly self-taught in geology, Hitchcock published in the first volume of his mentor’s ambitious new journal and continued to contribute throughout his life. Everything about the burgeoning new field interested Hitchcock, and his omnivorous intellect probed all sorts of geological topics. Over the mid-19th century, he became one of the most widely recognized and respected American geologists. Of course, the quality of his work was the most important factor, but a nod to Benjamin Silliman is in order, for using his personal influence and giving Hitchcock a place to establish an international reputation. For more on the map, and to see other historical maps of Massachusetts and the Connecticut River valley, click here.